Good morning, and welcome to the 2018-2019 academic year. Greetings to all, faculty, staff, returning students, and most importantly, to the Class of 2022. Congratulations. You’re all officially Bobcats. Three years ago, I sat in the very seats you all are sitting in right now, captivated by feelings of excitement, anxiousness, and definitely a lot of fear. The most vivid memory I have about my Convocation three years ago — and some of the faculty may remember this — was that much like today, it was one of the hottest days I’ve ever experienced in the state of Maine. But truly what was running through my mind was how in the world I was supposed to navigate these next four years: manage to play football, make friends, sleep, and find time to get involved. I’ll be honest, I had no idea how. What became apparent to me was that not knowing was okay, and that it would take time to adjust. It won’t take long, but you’ll get acclimated to the classes, to the long readings, to the professors and their different policies on laptops in the classroom, and to the jungle that is 6 p.m. Commons. Quite unexpectedly, while you’re acclimating yourself to each of those things, you will also discover that you’re acclimating yourself to the person that you’re becoming. Three years ago, I was simply a college student, but over time, the idea behind becoming someone who can effectuate change began to overtake the simplicity of just being a college student. Today, I stand before you with the firm belief that your journey through these next four years is going to do the same. I believe that you are about to embark on an adventure that is going to make you an agent for change no matter your field of study. I spent this past summer working for a legal aid provider in Maine, a firm that only represented people below 125 percent of the poverty level — the poor, the forgotten, individuals with mental disabilities and physical disabilities. I walked into a coalition of lawyers who were simply passionate about being compassionate. They were determined to remember those forgotten within our current system. From what I saw, that seemed to be the driving force behind everything they did. This firm used the majority of its resources to focus on housing discrimination, illegal evictions, subsidized housing, and the bevy of legal issues that come along with that. During the first week of my time working there, one of the lawyers who was working within the veterans unit came into my office quite frantic. He goes, “Walt, we’ve got an emergency. I’ll explain the car, but we gotta leave right now.” I got up kind of scared, and there was a sort of calmness about him, and I quickly understood that when he said, “We’ve got an emergency,” he meant one of our clients had an emergency. In the car, he explained to me that a veteran he had been working with was served with an eviction notice because he had not been paying his rent. The reason this veteran had not been paying his rent was because of a bunch of problems with his apartment — mice, mold, no hot water for long periods of time. This veteran, who was also struggling with some other disabilities, had gotten so fed up that he got all of his things, placed them in his truck, and decided to spend the night in the parking lot of a local Shaw’s grocery store. We traveled there to meet him. As I sat there, listening to him explain the issues within his apartment and the aggressive conversations his landlord had with him, I began to get angry for him. I looked at the lawyer with this look that said, you know, we got what we need. That moment, I felt so many emotions, because firstly, I wanted the landlord to pay for what he had done. But I also struggle to understand how someone who dedicated his life to defending his country felt that he couldn’t even defend himself, nor even see himself as worthy as being defended. We escorted him to a shelter, and I spent that day torn up with the fact that I couldn’t do more for him. A few weeks later, I sat in on a case meeting in which paralegals and lawyers discussed upcoming cases, next steps for clients, legal strategy. When the eviction cases came up, we noticed that a few of them were coming from the same trailer park, the same landlord, the same living conditions. One of the lawyers decided that she was going there to meet the clients in person, to gather some more information. I went along with her. On that day, we visited four trailers. On that day, I realized I spent my entire life taking everything I had for granted. On the outside, there were tarps covering old roofs that had gone years without repair. On the inside, there were leaks. The floors and the walls had holes in them. Doors were broken, windows were shattered. We were given documents that confirmed their water was contaminated. We heard stories where these people begged their landlord to fix things, and he had declined, and the only thing these people kept saying was that they wanted a safe place for them and their children, and they were struggling financially, so it’d be quite difficult for them to just up and move to a new place. Before we left, I listened as one family member described more details about their living conditions. As he talked, he quickly stopped and asked me to turn around. It was their landlord. I watched this man on the porch of this beautiful well-kept home as he smiled and waved at us. I got in the car, and I was almost brought to tears at the thought of those children being forced to live in those conditions and the landlord’s blatant disregard for his obligation to keep his tenants safe. Within the next three weeks, we were in court every Wednesday and Friday battling for these people, hearing after hearing, settlement after settlement. When it was all over, these people were in tears, thanking us for the help, but most importantly, just taking the time to listen and to care about what they were going through. After those two instances, it became apparent to me that in order to effectuate the change that we want to see within this world, we’ve got to spend more time getting closer to those forgotten within our society, spend more time placing ourselves into uncomfortable situations that place us amongst the forgotten, because in a lot of ways, it was those people that showed me what true compassion, true equality and true justice were all about. Honestly, as these realizations became clearer over time, I questioned how I cannot have noticed the things that I experienced right on this campus, where individuals passionate about change put themselves in uncomfortable situations in order to make long lasting impacts. I watched a student by the name of Lydia Sullivan, who had the desire to transform our safe ride program. She had so many flourishing ideas, scheduled meeting after meeting with members of our administration. I watched this team challenge a system that had been in place for years, and with our hard work, her goal had been achieved, one that will benefit all students at Bates. I watched Bates Student Action, a student led group on campus, organize for two weeks to hold a rally for gun control right outside of Commons, and, less than a month later, hold another rally to highlight the benefits and the cost of making a Bates education truly accessible to all. I watched our student community go above and beyond each and every day, volunteering to help asylum seekers, local schoolchildren, victims of domestic violence, getting closer to those disenfranchised. The true power of the Bates experience lies within two distinct factors. The first is that we are a community that places value on respect and kindness — kindness not only towards each other but to those within our surrounding community and even those that may disagree with our mission. 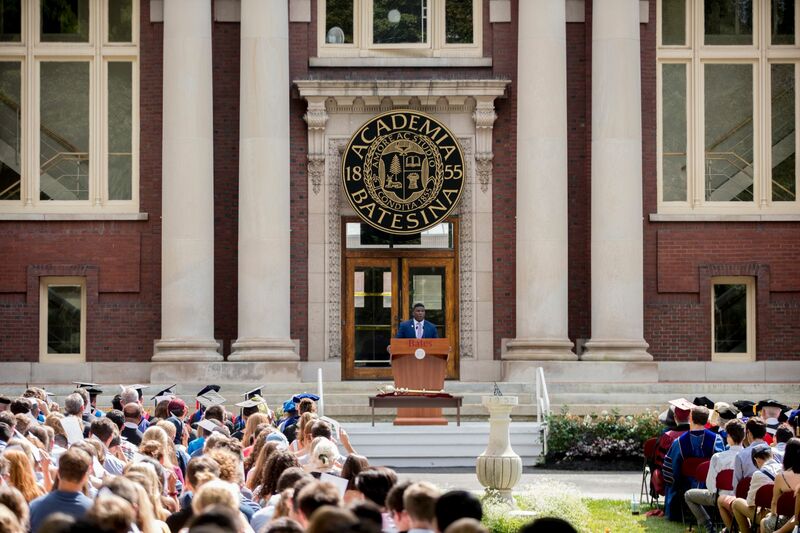 What I want to convey to you today is that the other true power of the Bates experience is not that we were founded by Baptist abolitionists, not that we are one of the top liberal arts colleges in the country. No, the true splendor of the Bates experience is that no matter what you plan to do with your majors or your profession, here we challenge you to take your passion and to create ways to make your passion the driving force behind how you change the world. Bates does not define you. It gives you all the tools necessary to define yourself, to discover the very things that have been lying dormant within you. This class, the Class of 2022, each of you has the power to be a class unafraid to take action, that does not shy away from injustice but rather forcefully seeks out ways to abolish it. It was Michelangelo who said that every block of stone has a statue inside it, and the task of a sculptor is to discover it. I want you all to think of your next four years as that stone and everything you do, from this moment on, as you chiseling away at it until the next time you’re all here on this quad receiving your diplomas. Everyone will sit in awe of your statue that you’ve created. Each and every single one of you has a gift, a passion and the ability to transform the proverbial learning experience into a journey rooted in making a difference. Fortunately, you are now part of a community where education and making impactful change are one in the same. I encourage you all today to spend this journey remembering those who are banking on you to discover your passion, to see this journey through no matter how difficult things may seem, and to dedicate your time to not only pursuing knowledge but to fostering an environment where strength, passion, equality and change are the norm, and that change must begin right here on this campus. Today, I welcome you into the Bates family. As you embark on this journey, I look forward to watching you grow. I look forward to watching you discover your passions, and more importantly, as a member of your extended family, I’m so excited to begin invoking those changes that we all want to see together.